Most people are big fans of Haldiram’s products. I tasted Navaratan mix and checked out the ingredients. 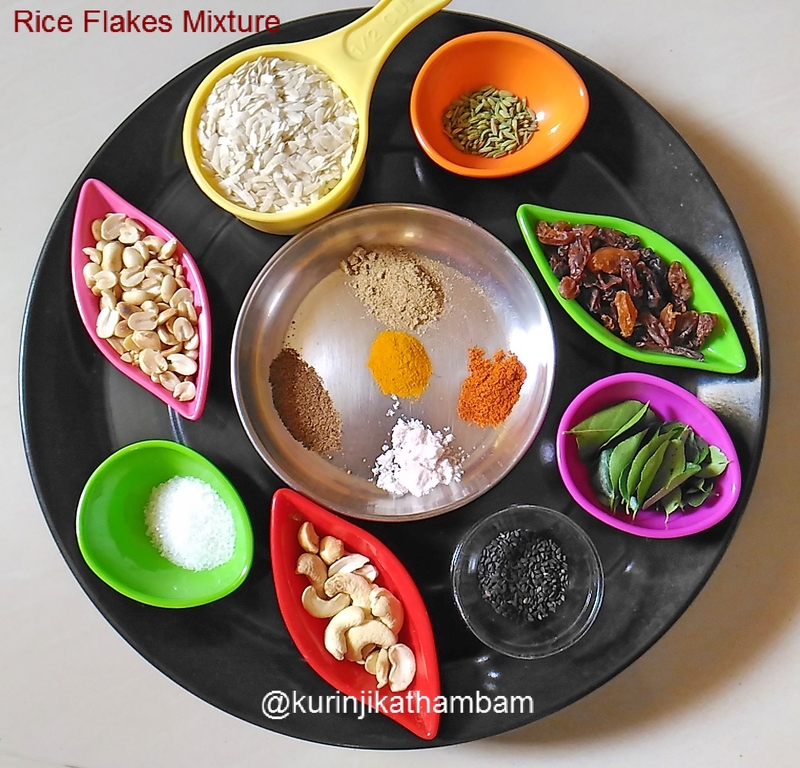 I tried this mixture using the same set of ingredients except boondi. 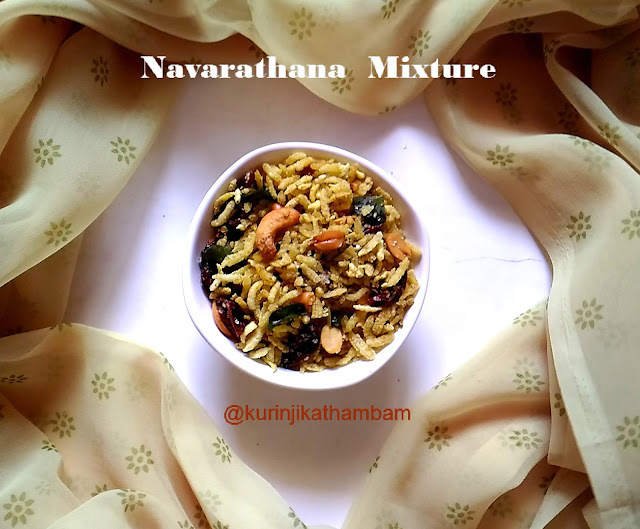 It was a big hit at home and I recommend this for festival snacks as it is very easy and very quick to make. Click here to view full collection of Diwali Snacks Recipes. 1. Heat the oil in a frying pan; fry the rice flakes till they become double in its size and also till sounds stop completely. Also take them out before they turn into brown. Drain the excess oil and and keep it on the tissue paper. Fry all the rice flakes like this. 2. 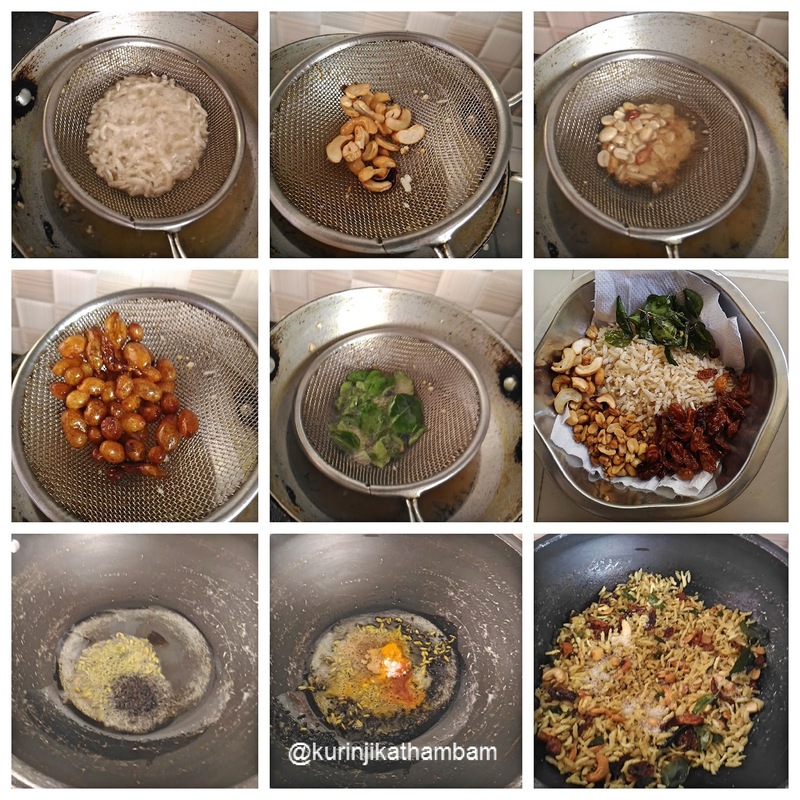 Deep fry the ground nuts and cashew nuts separately till they become golden color. Take them out from the oil and drain the excess oil; put them on the tissue paper. 3. Deep fry the dry grapes till they become bulge . Take them out from the oil and drain the excess oil. Keep them on the tissue paper. 4. Deep fry the curry leaves till they become crisp. Drain the oil and keep them on the tissue paper. 5. Heat the coconut oil in a wide pan, add fennel seeds and wait for popping. 6. Then add the sesame seeds. Now add the dry powders ( red chilli powder, chat masala, turmeric powder and black pepper powder) and fry till the raw smell goes off. 7. Now add the deep fried items (from 1-4) and mix them gently. Cook for 2 mins. Switch off the flame. 8. Then add the black salt and sugar. Again mix them gently or toss them gently and allow it to cool down completely. Store it in a air tight container for later use. 1. I have used big strainer (like juice strainer) for deep frying. If you do not have big strainer prepare this using small quantity of oil.